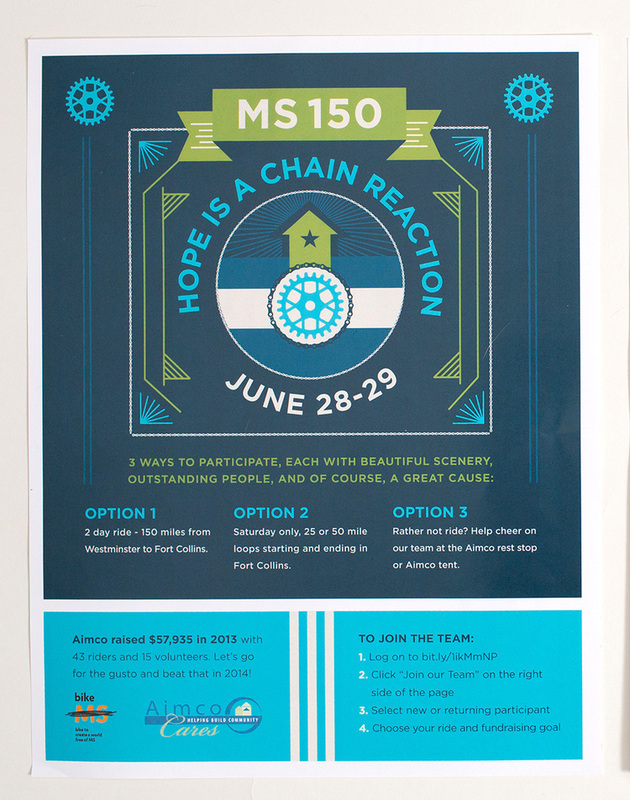 MS 150 - Bike Jersey and Collateral — Rook Design Co. I was asked to design the 2014 MS150 charity ride bike jersey for the AIMCO corporate team. In previous years the jerseys were elaborate, with fine details and hand drawn elements. I wanted to do a more vintage cycling feel, with bold simple graphics. I kicked around several themes, from "Hope is a Chain Reaction" to "Ride with Gusto" which is an homage to the company's core values. I stuck to the corporate color palatte and incorporated a deconstructed Colorado flag and perspective lines on the back of the jersey to encourage riders to keep going.